Designed to easily and safely haul items, such as motors, compressors and toolboxes up to the roof. “Cranky” Portable Winch slips on and off the building’s permanently mounted Cranky Building Post , the “Port - A - Post” (for use with roof hatch or permanently mounted vertical ladders) or it on the “Cranky” Truck or Van Mount Post . At 29 pounds, “Cranky” is easy to transport. 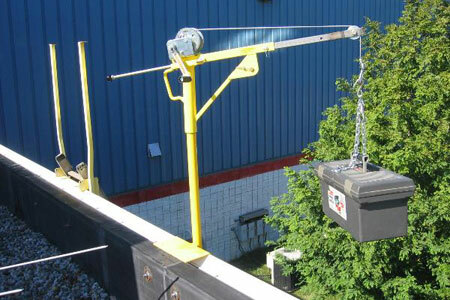 “Cranky” and “Cranky” accessories allow one tech to lift heavier items from vehicle to roof without the expense of a crane or second technician. “Cranky” Portable Winch System uses a grab hook to tote items up to 300 pounds . A lift chain with S hooks is also included. “Cranky” Portable Winch is equipped with a brake to stop the hand crank for added safety and a back pulley to center loads when hoisting through a smaller roof hatch. The crank ratio is 4.4:1.